Adharanand Finn has long been on a mission to uncover the secret of the fastest distance runners. In Running with the Kenyans, he travelled to the African highlands to see how the fastest marathoners in the world trained (on trails, at altitude, for life). Now Finn’s journey brings him to Japan to see what motivates athletes in the most running-obsessed country in the world. His new book, The Way of the Runner: A Journey into the Fabled World of Japanese Running, is the culmination of his time in the country where he worked closely with coaches, amateurs, and pros to see what makes them tick. In this passage from The Way of the Runner, Finn leans on functional fitness guru Kelly Starrett to try to get his own running form in order — and then test his mettle in the ultimate race, a Japanese ekiden. Kelly Starrett, author of the book Ready to Run says the squat is a fairly low-level test, and the fact that I’m struggling so pitifully to do it means my body isn’t functioning with its full range of movement. A few weeks after visiting [barefoot running coach Lee] Saxby, one afternoon as I’m standing waiting for my children to come out of school, one of the other parents tells me he’s a functional movement specialist. We get talking and once he hears my about [my desire to run faster by utilizing barefoot running], he tells me to come and see him. He says he has some techniques he thinks I might find interesting. The parent, Joe Kelly, is well versed in the theories of barefoot running, and goes by the pseudonyms ‘BarefootAthlete’ online. He agrees with Saxby, though, that running efficiently is not just about taking your shoes off. To run well is a skill, and to do it well your whole body needs to be functioning properly, not just your feet. This is why many people who take up barefoot or minimal running end up injured. You can’t just put on minimal shoes and start running unless your body, your hardware, is up to it. Is that what I’ve been doing, I wonder, with my malfunctioning body that can’t even squat? Is that why my tendons hurt? I decide to go to see Kelly, to see if he can get me running faster, without the handbrake on. He tells me he has recently learnt a new treatment called muscle activation, which works on the premise that if parts of your body are not working properly, other parts will have to compensate for them, and soon nothing will be doing the job it was designed for, and the whole body will start to collapse in on itself. The result, he says, is the hunched, shuffling running style many of us will be all too familiar with, and aches and pains in all sorts of places. This particular technique Kelly uses on me is called ‘Be Activated’ and was devised by South African physiotherapist and kinesiologist Douglas Heel, but there are many other versions which all work along the same principles. Heel was a student under the eminent sports scientist Tim Noakes, author of running bible The Lore of Running. Noakes is famous for his central governor fatigue theory, which says that the brain controls the level of fatigue you feel in your body, shutting it down when it senses it is becoming overworked. Over thousands of years, the brain learnt that it was best to overcompensate, shutting the body down early in order to keep something in reserve in case of an emergency. So, in theory, no matter how tired you are, no matter how exhausted you feel, if you were to spot a lion, you would suddenly find reserves of energy to run faster. What the muscle activation treatment is doing, then, is sending a message back to the brain to say, it’s OK, these muscles are not really fatigued, we haven’t been running across the scorched earth for days, there are no lions around, everything is safe and well. Once the stressed muscles are switched back on, everything else can go back to doing its own job, and your body can return to its natural and fully functioning sequence again. Kelly gets me to lie down on his treatment table and starts pressing his finger into a malfunctioning stressball of a body. What follows is one of the most painful hours of my life. ‘I’ve had women tell me the pain is as bad as childbirth,’ he grins while digging his fingers into my hips. It feels like he is twisting a knife in at times, though he assures me he’s really pressing lightly. He’s working on neurolymphatic reflex points, trigger points on my body that stimulate the muscles into action. And some of the results are unnervingly instant. At one point he has me sitting on a chair and then standing up without using my hands. This is no problem, of course, although I can feel my legs straining when I do it. However, after some painful pressing, I try it again and I almost leap out of the chair as though I’ve been sitting on a compressed spring. To demonstrate another activation point, he pulls my legs to the side and tells me to hold them there while he tries to push them back to the middle. I can’t. Not even close. It’s as though I have no muscles capable of carrying out the instruction. It’s a blind spot in my muscle power. After a few minutes of torturous pressing, he tries again. ‘OK, hold your legs out to the side.’ He pushes, and suddenly muscles that didn’t exist before kick into action and I’m holding him. He pushes some more, harder this time, but I’m holding firm. It’s a miracle. The next weekend, I take my newly activated legs out to race the Bideford half-marathon in north Devon. I’m not sure what to expect. As amazing as it was to see muscles materializing out of thin air to hold my legs out sideways, how useful is that for running? Many of Heel’s clients are sports stars from the worlds of rugby and golf, where extended mobility in different directions seems more important. In running the movement tends to be fairly unidirectional – just the same repetitive steps in the same forward motion. However, during my time in Kenya, training with some of the greatest long-distance runners on the planet, I realized that one of the biggest advantages they have over most western runners is their fluid movement and running form. One of the most fascinating things about Kenyan runners is that the event they dominate more than any other is the steeplechase – they have won every single Men’s Olympic gold medal since 1968 in this event, except for the two Olympics Kenya boycotted. Yet there are almost no facilities for steeplechase training in the entire country. So why are they so good at it? With a more active lifestyle, and less time spent sitting slouched in cars, on sofas, or hunched over computer screens, Kenyans are accustomed to using their bodies in a more natural sequence. The squat again. While Born to Run railed against the evil of running shoes, Saxby tells me we should add another item to that list: chairs. ‘The two big evils in the modern world, the things that break down our ability to function as we are designed to, are shoes and chairs,’ he says. Kelly Starrett agrees. ‘Sitting on chairs is a disaster,’ he says, before listing all the problems it causes. It’s a long list. If this is true, in Japan they are at least halfway there. As well as having squat loos everywhere, most people still eat kneeling on the floor around a small low table, both in their homes and in restaurants. When I go to interview people, or meet the teachers at my children’s school, I often find myself being led to a room with cushions on the floor rather than sofas or chairs and tables. Each time I amaze people with my inability to sit on my knees for more than a few seconds. It’s as though every joint and muscle in my legs is being squeezed and twisted. I’m not alone. It’s a rite many westerners go through when they visit Japan. ‘It’s OK, sit how you like,’ people will say, looking at me kindly, with a touch of pity. But surely something is not right in my body for me to be struggling so much with a movement that seems so simple and natural to everyone else. At the Bideford half-marathon it’s a windy day, but the course is mostly flat. My best time, run shortly after I returned from my six’ months training in Kenya, is 1 hour 23 minutes. I set my watch for 1:22 pace and head off. Despite being hampered by a bad stitch, which forces me to stop twice, I run a big personal best of 1:19. A few weeks later, after some more prodding from Kelly, I run another half-marathon in 1:18. It’s difficult to be sure how much of this improvement is down to Kelly’s treatment, of course, but something is definitely working. The key is not the specifics of the muscle activation technique, but the basic issue it is attempting to resolve: my malfunctioning body. Both Kelly and Saxby are making the same point, and giving me some techniques to address it, namely that if I want to run well, with good form, and to avoid injury, my body needs to start functioning as it was designed to. My whole body, not just my feet. As well as his torture sessions, Kelly has me doing core workout sessions using kettle bells and he gets me skipping. He is also a big fan of climbing trees as a way to improve function. ‘Form follows function,’ he keeps telling men, as I clamber around the wall bars in his warehouse gym in Devon. All of this about returning our bodies to their natural state. As Saxby’s zoo humans, we’re compromised by our environment, which is set up to make life ever easier, but less active. Many modern cars have now replaces the handbrake with a little switch operated by one finer. Even that tiny effort of pulling up a brake lever has been ironed out. Where will it end? In rural Kenya, of course, life is much more active. When Saxby talks of zoo humans, I can’t help recalling the words of Renato Canova, the coach in Kenya: ‘To win a big city marathon, you need to be a little wild.’ He meant you need to take risks, be wild at heart. But maybe, physically you need to be a little wild too. 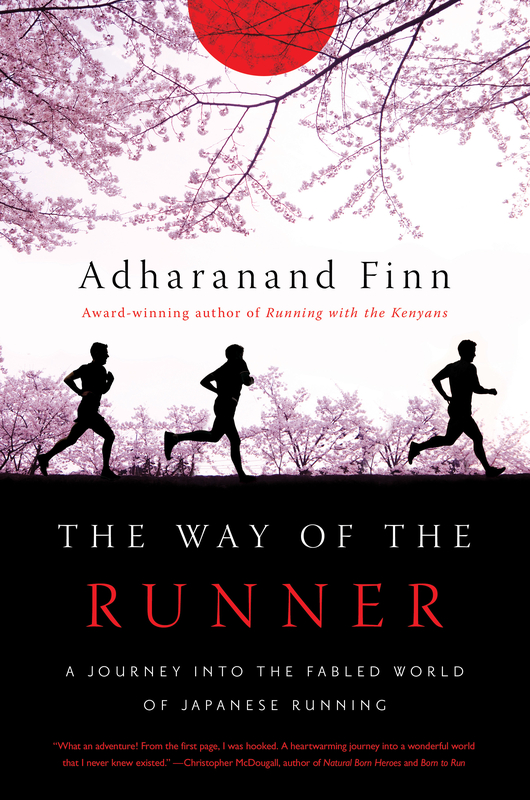 The Way of the Runner is on sale now.